Simply say “Costa Rica” and vivid images of paradise instantly flood the imagination. This eight-day tour makes those dreams a reality while letting you connect with the country’s charming people. Your spirits will be lifted with a visit to Mi Cafecito Community Coffee Plantation, a G for Good project supporting 200 local farmers, before carrying on to the outdoor utopia that is La Fortuna. There you’ll be treated to a world of wellness, with yoga sessions overlooking the Arenal Volcano, hiking, free time for meditation, and a rejuvenating trip to thermal hot springs. Continue on to remote Rincón de la Vieja for more yoga and a therapeutic mud bath before a final stop in Playa Carrillo – home to a beach devoid of buildings, hotels, and restaurants that will give your mind a sense of clarity you may have previously thought impossible. Arrive at any time and meet your included transfer to the hotel. This evening, meet the group and CEO for a welcome meeting. Take this opportunity to set your intention for the trip ahead. Drive to Sarapiquí to visit the G Adventures-supported Mi Cafecito Community Coffee Plantation. Learn about the impact this project has had on the community and sample some of the products they sell. Continue on to La Fortuna, an outdoor paradise and the adventure capital of Costa Rica. Join the group for the first included yoga session on the hotel grounds overlooking Arenal Volcano. Visit nearby Lake Arenal this morning for a stand-up paddleboard (SUP) yoga class. Enjoy free time in the afternoon to take part in optional activities around La Fortuna – opt to go canyoning, hiking, or use the time for rest and meditation. In the evening, visit nearby hot springs for a relaxing soak in the thermal waters. Travel to the Guanacaste province and head to Rincón de la Vieja National Park. 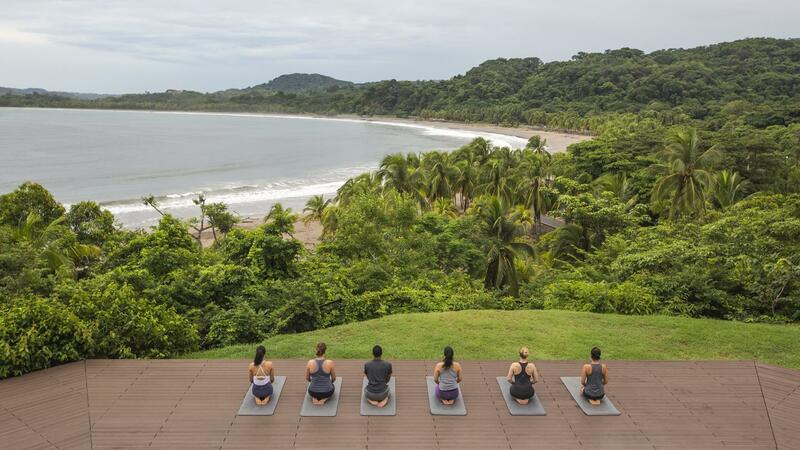 After arriving, join the group for an afternoon yoga session on the grounds of the eco-lodge before free time to relax or explore the great outdoors. Enjoy a day of exploring Rincón de la Vieja National Park. Start by taking a short hike to one of the volcanic mud pools in the area. After a rejuvenating exfoliation with the volcanic mud, rinse off at nearby thermal pools. This afternoon is free to explore the park, or spend time enjoying the lodge. Travel to Playa Carrillo on the Nicoya Peninsula, a laidback beach town on the Pacific Coast. Take part in a sunset yoga class overlooking the picture perfect crescent bay of Playa Carrillo. Start the day with a morning yoga class on the beach before learning how to hang 10 at an included surf lesson. This afternoon is free for beach activities, meditation, or reflecting on the journey of the past week. Bid farewell to the coast and travel back to San José. Trip ends on arrival to the capital city. Accommodations: Hotels (5 Nights), eco-lodge (2 Nights). Staff & experts: Chief Experience Officer (CEO) throughout, local guides.